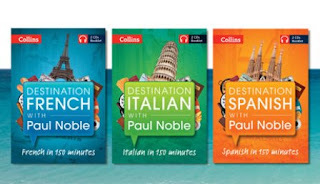 The Paul Noble Language Institute, in conjunction with publisher Collins, has produced two ranges of CD courses that allow you to learn French, Spanish, Italian and German using the Paul Noble Method but without ever needing to attend a language class! Our "Destination" foreign language courses are designed to help get you ready for a trip abroad in just 150 minutes! They focus on teaching you how to express yourself with regard to your typical travel needs, so that you no longer need to always be carrying a phrasebook around with you when you're on holiday. Our "Learn ... with Paul Noble" courses are your chance to have a one-to-one lesson from Paul and his native-speaking, co-teacher expert. Each course is 13 hours long and will lead you through the language you're studying so that you learn to manipulate the language and create sentences by yourself, rather than just memorise words and phrases! I took your apptitude test and scored 39 in total, my weakest points were on questions 1 and 2, where I scored 3 and 2; but the rest of the questions I scored 4 and mostly 5.